Take a walk through virtual reality and other immersive environment tools for planning. Immersive technologies — virtual reality, mixed reality, and 360 video — are increasingly being used by everyday people, thanks to faster software and new hardware options that make them easier to operate. Today, even the less technically inclined can access spherical street views across the world using Google Street View, capture virtual creatures in real life using Pokémon GO, and watch immersive news videos through a New York Times app called NYT VR. Design professionals are exploring the use of immersive environments, too. New technological improvements and the increasing prevalence of 3-D models in architecture, landscape architecture, urban design, and planning help put the tools for creating immersive environments in the hands of practitioners. A few years ago in San Francisco, planners invited passersby to peer through the eyes of an OWL — a virtual reality viewer, not the nocturnal bird — to experience what the city's Market Street corridor could be. More recently in San Jose, landscape architects with the SWA Group helped stakeholders imagine different alternatives for a new urban campus of government offices, with help from Scope, an app loaded onto an iPhone. In Washington, D.C., virtual reality tools brought pedestrian intersection plans to life, and in Singapore and Riyadh, Saudi Arabia, mixed-reality tools immersed people in what could be those cities' futures. For planning and design professionals, immersive reality can help produce better design solutions. Designers can view existing sites in more detail, allowing for a more accurate assessment of conditions. They can use the tools to test assumptions and unearth questions or problems earlier in the design process. Even during construction, immersive environment technology can allow for more refined quality control; using mixed reality, designers can overlay their 3-D design models on top of what is being built on-site, making it easier to catch construction mistakes. Immersive environments are often impressive, even amazing — both technologically and visually — and that can help designers translate ideas to clients and the general public. The imagery can be more realistic than a typical flat rendering. Also, proposals can be more engaging, lengthening the attention span of users as they virtually explore the space. "Immersive environments" refers to a collection of several emerging technologies with similar perceptual qualities. These vary in the type of virtual space we can inhabit, and how much mobility we have within that space. What are your options? SPHERICAL PANORAMAS use a series of stitched together spherical images that a user can virtually move through to create the illusion of real space. This environment is familiar, thanks to Google Street View. To view them, you use a headset and rotate your head, or use a mouse or touch screen to pan around a spherical image on a desktop or tablet. VIRTUAL REALITY is a modeled and textured space. The Climb video game is an example of VR technology. To experience VR, a user wears a tethered headset to move freely through a virtual space. Wand controllers, a more traditional game controller with forward/back buttons, or walking short distances of a few feet add to the illusion of covering distance, and you can even teleport. A gaze, gesture, or voice input, which are sometimes options in VR applications, allow you to navigate, interact, or select menu options in the environment. MIXED REALITY overlays digital 3-D models or animations onto existing, real-world conditions. MR is often also interchangeably called augmented reality. A familiar example? Snapchat filters. To experience MR, you can use a smartphone or tablet held at arms-length to layer a model or animation over your face or what's actually there. 360 VIDEOS use video cameras to capture a sphere, recording real places and events and allowing the viewer to look all around during playback. The immersive videos of RYOT, a video production company focusing on journalism, are an example of 360 video technology. The videos are viewed with a headset and they move when you move your head; on a desktop, you use a mouse or touch screen to pan around a spherical video. For the Better Market Street project, the San Francisco Department of Planning wanted to get feedback on its plans for Market Street downtown. In 2013, Neil Hrushowy, manager of the City Design Group at the San Francisco Planning Department, started working with Aaron Selverston, who was making prototypes of a public VR viewer called an OWL. 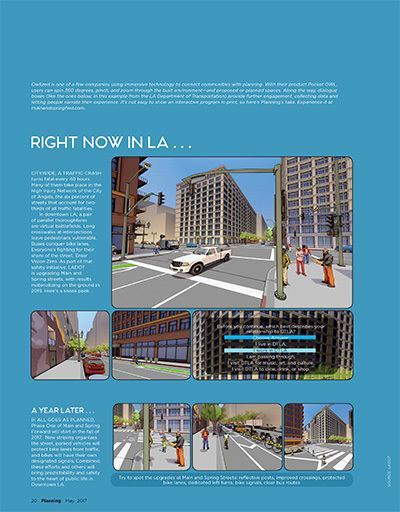 Selverston's company, Owlized, partnered with Tristan Randall at Autodesk to create the virtual environment around Market Street with design options from the planning department. Randall and his team used their company's software, InfraWorks, which can import GIS data, Revit models, and Lidar data to make 3-D digital models. They then exported two spherical panoramas depicting different design options, loaded the images on an iPad mini, and installed them into the OWL prototype. The OWL, which resembles an old coin-operated telescope you might see at a national park, was left out on Market Street for one week. The robust viewer enabled residents, office workers, and passersby to peer into the contraptions and view the options. "Visualization is powerful and we have to become way more effective in our tools," says Hrushowy. "Plan views and beautiful renderings don't do a lot of our designs justice, so we often doctor them up to give people as immersive and self-driven of an experience as we possibly can. If your ideal is an informed democratic process by which people understand what their choices are and let you know what they prefer, the virtual and augmented reality model is much better." As a result of learning from the Market Street project, Owlized incorporated a survey function to get direct feedback. In another context, planners at SWA Group worked with that firm's innovation lab, XL, to show designs to clients in San Jose, California. Santa Clara County, in partnership with a private developer, asked SWA Group planners and urban designers to imagine a new urban campus for county offices. In January, the firm held an event to showcase four areas of the design to county project managers, employees, and facilities managers. Stakeholders were able to immersively experience and talk about spaces that will be built over a 20-year span. The team used iPhones loaded with the app Scope, developed by IrisVR, to run spherical panoramas that fit into Google Cardboard viewers. Each viewer showed a different future space. Priya Cherukuru, the county's capital projects manager, and David Barry, AICP, LEED AP, its senior facilities architect, were on hand to answer questions. "The experience raised [county employees'] understanding of the [planning] process, and helped them to be included in that process," says Ashley Langworthy, AICP, of SWA Group, at the event. Barry noted that they could use a similar setup at the next community outreach meeting. Other uses of immersive environments include MIT Media Lab's mixed-reality environment called CityScope, which they have used with the Centre for Livable Cities in Singapore and Arriyadh Development Authority. The planning and design firm Arup developed a virtual reality headset to communicate infrastructure and transport options to their clients. The Golden Triangle Business Improvement District in D.C. used VR to help plan pedestrian intersections. Last fall, Owlized worked with the city of Santa Monica, California, to engage locals and visitors on the potential impacts of sea-level rise. View finders placed on the Santa Monica Pier showed how the beach could be affected by storm-enhanced waves as well as the potential solutions offered by restored dunes. A survey function let them weigh in. "It's hard for people to connect on the issue of climate change because it seems so far away," says Garrett Wong, the city's senior sustainability analyst. "This tool helps make it feel real. People have a visceral reaction and come away with a more informed idea of what climate change may bring." Due to the high demand for immersive environment tech, new gear and gadgets are constantly being developed and upgraded for gaming, real estate, journalism, mapping, and design applications. Here's a snapshot of the software and hardware currently available and what it costs. And since learning new software takes time, we've also included the estimated time investment for a design or planning professional with experience in using 3-D software who is a novice with these technologies. 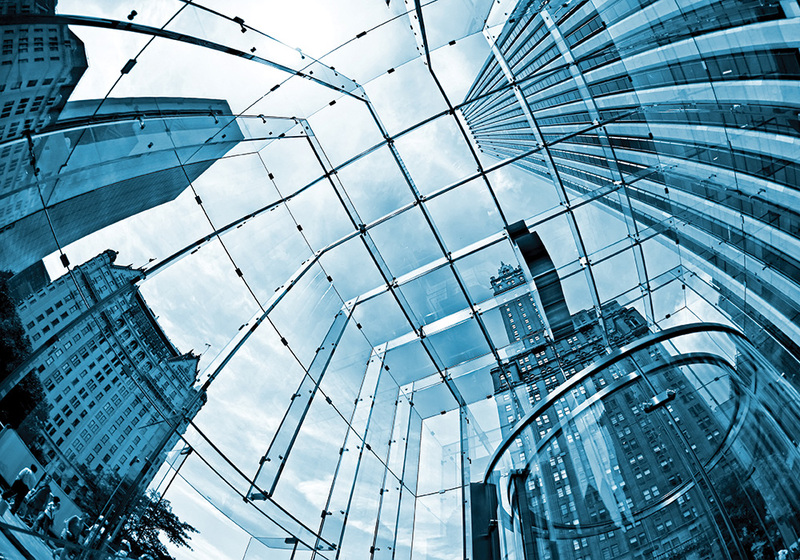 View existing site conditions immersively. Ten minutes to navigate and understand the 360 functions of Google Street View on a desktop or smartphone. Export a rendered spherical panorama for viewing on a smartphone or smartphone-capable headset. Assuming you’ve built a model and rendered the environment using software Lumion or Esri’s CityEngine, 15 minutes. Overlay a custom 3-D model in realworld space using Augment, a mixed reality app. Up to five hours to prepare and add your model, create a custom tracker to locate in real space, and troubleshoot. Experience your custom model with a tethered VR headset. Up to six hours prepping 3-D model files, importing into a VR software, learning and navigating in IrisVR Prospect, and interfacing with the headset. One to two weeks to produce a custom virtual reality environment using a game engine software such as Unity or Unreal Engine. Make a 360 video of existing site conditions. Ten hours to produce a high-quality 360 video. Once they are produced with software, immersive environments require hardware for viewing. Here’s a breakdown, from the cheapest to most pricey. A number of immersive technologies already have high hardware functionality, a low time investment in learning software, and a relatively modest cost. Early adopters in planning are using 360 panoramas and 360 videos for visualization and community engagement purposes. For panoramas, planners can tap into an existing work flow of 3-D modeling and rendering through programs like SketchUp plus Lumion or Esri's CityEngine. A quick export creates a spherical JPG which can then be used to better understand design implications and to project future urban scenarios such as sea-level rise. For 360 videos, designers can simply upgrade their recording equipment to create immersive videos that can work well for community engagement or public awareness campaigns. The near future is likely to bring even greater potential for employing MR and VR in the planning process, including true scale, 3-D visualization in real environments. Today, MR apps are limited by model complexity, and in geometry and texture; most do not resemble reality. With improvements in graphic quality, MR apps could be a powerful way to superimpose realistic planning ideas onto the world around us using personal smartphones or tablets. 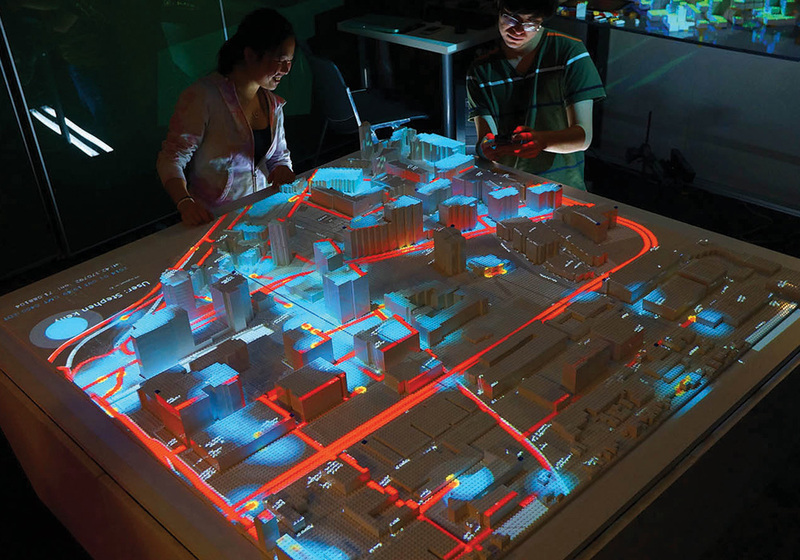 MIT's Media Lab uses CityScope to create realistic outcomes of various planning decisions. Programmed LEGO bricks work with overhead projectors that beam color-coded metrics onto them. The light layer shown above maps Twitter user activity as a proxy for human activity. Photo by Kent Larson, Ira Winder, Carson Smuts, and Mohammad Hadhrawi. With VR, there are three main drawbacks to using the current technology for planning purposes: the experience is limited to individual users, headsets are cost prohibitive for most planning agencies and organizations, and the set-up requires tethering to a powerful desktop computer. Future developments in VR software from developers such as IrisVR and InsiteVR could add small but key functionalities, such as being able to simultaneously view on a headset and a monitor, expanding the experience beyond a single user. Ailyn Mendoza at IrisVR says the company has been expanding its user base from an original focus on architecture to other industries. Planning could benefit from this attention on other workflows, especially if GIS software becomes a focus. VR hardware options such as the Oculus Rift and HTC Vive could become more affordable and less cumbersome. In the next five years, robust but expensive hardware like the Microsoft HoloLens is poised to become a powerful tool for planning. The HoloLens, a self-contained holographic computer packaged as a headset, can function as both VR and MR technology. Due to its compact form, there are no spatial limitations; it can travel wherever you do. Hector Tarrido-Picart, a former product design engineer at Esri who has worked on 3-D urban planning in the smart 3-D cities market, thinks augmented reality is the best bet for the future. "As a person that is visually impaired, I personally advocate for augmented reality where the impact of planning can be seen from the perspective of the citizen, at eye level," he says. "I still think that visually learning from inhabiting the space, with all its tactile, smell, and musical/noise qualities, is more powerful than being in a total digital world." However, regardless of which immersive environments become ascendant, he says, "mobile virtual environments ... have the potential to truly democratize the process of urban planning and make approval of any future development intuitive to the citizens of cities." Owlized is one of a few companies using immersive technology to connect communities with planning. With their product Pocket OWL, users can spin 360 degrees, pinch, and zoom through the built environment — and proposed or planned spaces. Along the way, dialogue boxes provide further engagement, collecting data and letting people narrate their experience.